Effective offloading of high pressure areas of the foot is a key treatment principle for diabetic foot ulcers. Diabetic foot ulcers are best offloaded with knee-high devices such as total contact cast or walker. Healing of the ulcer occurs most effectively when these devices are non-removable. It is important to consider both the offloading properties of a device and the patient’s experience with the device. 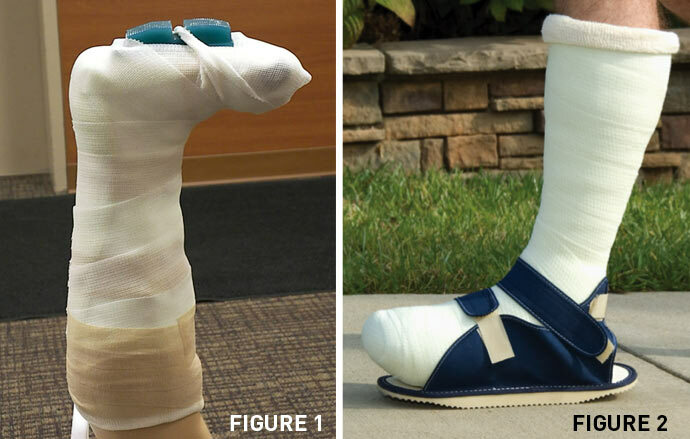 Consider “transitional offloading” when moving a patient from cast or walker to custom-molded shoes. 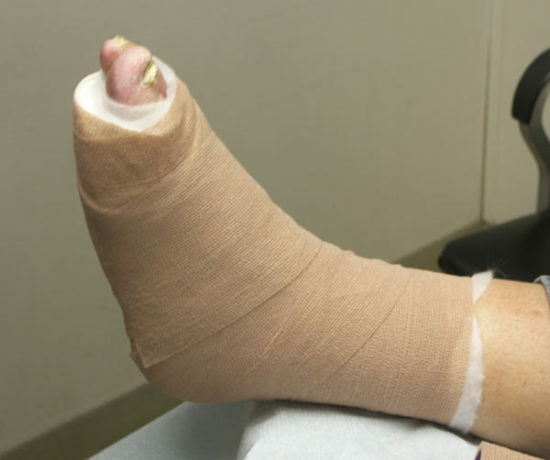 Although the total contact cast (TCC) has long been considered the gold standard for offloading the diabetic foot, few practitioners use this modality daily.19,20,21 The majority of studies of the TCC have demonstrated healing rates as high as 90% at 12 weeks.22,23 Despite these data, the majority of practitioners treating DFUs use one of several alternative devices to try and accomplish the same results. These include the removable cast walker (RCW), the irremovable cast walker (iRCW) or instant total contact cast (iTCC), the modified Carville healing sandal, the felted foam technique, the football dressing, commercial offloading shoes, and depth footwear. There has been much research dedicated to improving offloading of diabetic feet in recent years. This review will cover recent advances in offloading. When a person steps on the ground, the ground exerts a force on the body known as the ground reactive force. This ground reactive force can be split into two components: the horizontal component (also called shear stress) and the vertical component. The shear stresses and, less significantly, the vertical pressures are key contributory factors in the formation of DFUs and their poor healing potential.24 Plantar shear stresses are higher in people with diabetic neuropathy when compared to non-neuropathic counterparts.25 It has also been shown that diabetic patients with a history of foot ulcerations have significantly more plantar shear stress than diabetic patients with no history of ulceration.24 Current accepted treatment modalities for offloading DFUs include TCCs, RCWs, and iRCWs. Many of the advances in TCC have come from developing new systems which can increase efficiency and decrease application time. The application time and difficulty in applying the cast itself have traditionally been barriers to utilizing TCC in clinical setting. Several casting systems are now available which can ease the usage of the TCC (Table 1). The Rader football dressing was introduced in 200835 and its use has been increasing as more data has become available. The dressing can be used for patients in whom a TCC is contraindicated or when a cast walker cannot be obtained due to insurance limitations or other circumstances.35 The football dressing uses several layers of cast padding, secured with woven gauze roll bandage, additional padding, additional gauze and a layer of self-adherent wrap to finish the dressing and keep it in place. One can substitute a ¾-inch polyurethane foam layer against the foot or add a felted foam component to the dressing to augment its cushioning effect. is done by securing them in place with plaster, fiberglass, cohesive bandage, or a cable or ziptie. Like TCCs, cast walkers, both removable and irremovable, are contraindicated in patients with severe peripheral artery disease and poor balance.37 Because they are pre-fabricated and not custom-made, they may not be suitable for all patients, particularly those with lower extremity deformities, wider feet or very short legs.26 There are several other viable alternatives to TCCs in patients that may have contraindications. 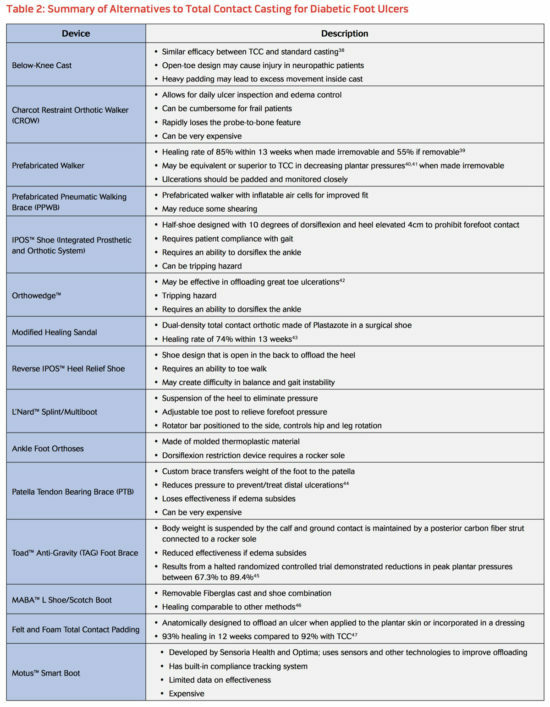 Table 238-47 lists alternatives to total contact casting. See Snyder and Lanier37 for an evaluation of these methods and their application to offloading DFUs. Total contact molding increases insole contact area, spreading pressure out across the entire surface of the foot. Multi-laminate insoles have the potential to be molded or conform over time, but do not have an inherent ability to offload. Without contouring, they are sophisticated cushioning devices at best. Some commercial offloading devices have insoles with removable hexagonal, square, or diamond shaped plugs to selectively offload specific areas of the foot. The plug insole system utilized by the Bonapeda Fors-15™ multi-density insole, in the Ossur™ Active Offloading Walker (formerly the DH Walker), the Darco Peg Assist™ system, and the Donjoy MaxTrax™ Diabetic Walking Boot are examples of such insole systems. necessary to fill the average- or high-arched foot. An alternative to this is the Bledsoe™ Boot which uses a thick Memory Foam™ insole that auto-conforms to the plantar sole with pressure. The removable feature of the prefabricated walker gives clinicians the ability to remove and reapply the devices for ulcer debridement and application of advanced wound-healing products. Patients can also remove them for dressing changes and wound care at home. Any time a device is removable, however, it increases the probability that the patient will walk without it. Most patients “cheat” and remove the devices to ambulate, placing their wound healing at risk.7 To avoid this problem in our clinic, we have employed a system of securing the walker with simple inexpensive plastic cable ties to ensure patient compliance. See Improving Patient Experience and Adherence53-57 on page 38. Although there are few studies demonstrating a reduction of force in areas of high pressure on the foot using the depth shoe or healing sandal, the RCW, iTCC, and TCC are irrefutably superior in their ability to produce consistently reproducible results when healing wounds.58 A “transitional approach,” first discussed by this author in 2010,59,60 represents a logical approach to applying each of the devices based on their demonstrated ability to offload the foot and heal open wounds. Table 3 outlines the transitional approach to diabetic foot offloading. 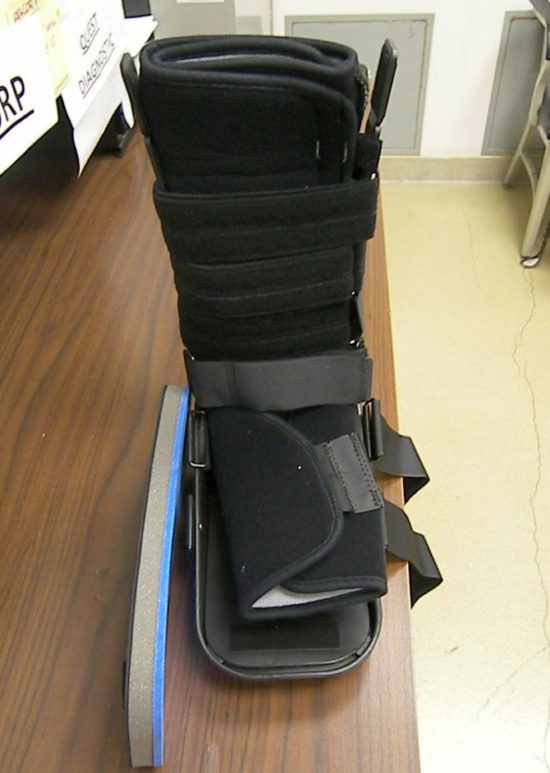 Knee-high devices that force compliance and restrict forward motion of the ankle should be employed as a first line treatment when the wound is open.8 Once the wound is closed, the patient can transition to a shoe-based total contact device such as the modified surgical shoe with an insert, or a commercial offloading shoe with a similar total contact-molded insole to protect and mature the skin for the first 3 to 4 weeks after wound closure. Rapid return to standard footwear is fraught with problems and may account for a large portion of the recurrences noted in the literature associated with diabetic foot wounds. Diabetic foot ulcerations are a major cause of morbidity and hospitalization. They are a significant predictive factor of infection, amputation, and mortality. Therefore, treating DFUs and improving patient outcomes deserves serious focus by clinicians. The primary method of treating diabetic foot ulcers is offloading. Of the offloading methods currently in use, knee-high casts that are irremovable, such as TCCs and iRCWs, have been associated with improved wound healing. Total contact casts are of benefit in patients with lower extremity deformities which require custom molded casts. Before applying casts, it is necessary to consider certain contraindications such as depth of ulcers, presence of infection, and peripheral artery disease. It is also important to consider the patient’s experience with the casting device, including how the device will impact their gait and ways of improving patient adherence if the device is removable. Addressing limb-length discrepancies (congenital and iatrogenic), improving patient education, and, more controversially, daily monitoring, are all strategies to consider when attempting to improve patient adherence with offloading devices. James McGuire, DPM, PT, LPed, FAPWHc, is Director of the Leonard S. Abrams Center for Advanced Wound Healing and Associate Professor of Medicine at Temple University School of Podiatric Medicine. Tyler Coye, BA, is a fourth-year medical student at Temple University School of Podiatric Medicine. To improve patient experience and adherence when wearing offloading devices, the clinician treating the diabetic foot ulcer should consider several key issues: patient comfort and gait, patient education, and methods of monitoring patient adherence levels. Electronic monitoring has the potential to improve adherence and reinforce a patient’s ownership of the healing process. Patient adherences is a significant challenge in offloading DFUs. Better offloading adherence is predictive of greater DFU healing at 6-week follow-up visits.52 A common means of forcing patient compliance is making a cast irremovable. However, making a cast irremovable and forcing patient compliance does not address the underlying reasons why a patient was non-adherent. A significant predictive factor of patient offloading adherence and delayed DFU healing is self-reported level of postural instability.53 As such, overcoming the challenge of adherence is inseparably linked to improving the gait and comfort of the patient wearing the offloading device. Crews and Candela54 found that when a contralateral limb lift is used in ankle-high removable cast walkers, there is an increase in patient comfort and gait. Monitoring patient adherence has generally been confined to research. There is no widespread objective measure of daily adherence utilized in foot clinics. Much of the determination of adherence has been subjective evaluation. There is a well-established positive association between adherence and ulcer healing. Therefore, there is a great need for technology which can monitor patient adherence throughout the day. Incorporating such a monitoring system into the standard care of DFUs could have significant benefits to patient outcomes.58 However, whether using such technology is ethical and fiscally responsible is still a matter of debate. Centers for Disease Control and Prevention. National Diabetes Statistics Report, 2017. Atlanta, GA: Centers for Disease Control and Prevention, US Dept of Health and Human Services. (2017). Brem H, Sheehan P, Rosenberg HJ, et al. Evidence-based protocol for diabetic foot ulcers. Plast Reconstr Surg. 2006;117(7Suppl):193S-209S. Lewis J, Lipp A. Pressure relieving interventions for treating diabetic foot ulcers. Cochrane Database Syst Rev. 2013;(1):CD002302. Cavanagh PR, Lipsky BA, Bradbury AW, Botek G. Treatment for diabetic foot ulcers. Lancet. 2005;366(9498):1725-1735. Ndip, Agbor, Leonard Ebah, and Aloysius Mbako. “Neuropathic diabetic foot ulcers–evidence-to-practice. Int J Gen Med. 2012;5:129-34. Woo K, Lo C, Alavi A, et al. An audit of leg and foot ulcer care in an Ontario community care access centre. Wound Care Canada. 2007;5(Suppl 1):S17-27. Armstrong DG, Boulton AJM, Bus SA. Diabetic foot ulcers and their recurrence. N Engl J Med. 2017;376(24):2367-2375. Bakker K, Apelqvist J, Lipsky BA, Van Netten JJ; International Working Group on the Diabetic Foot. et al. The 2015 IWGDF guidance documents on prevention and management of foot problems in diabetes: development of an evidence based global consensus. Diabetes Metab Res Rev. 2016;32(Suppl 1):2-6. Prompers L, Schaper N, Apelqvist J, et al. Prediction of outcome in individuals with diabetic foot ulcers: focus on the differences between individuals with and without peripheral arterial disease. The EURODIALE Study. Diabetologia. 2008;51(5):747-755. Wu SC, Crews RT, Armstrong DG. The pivotal role of offloading in the management of neuropathic foot ulceration. Curr Diab Rep. 2005;5(6): 423-429. Walsh JW, et al. “Association of diabetic foot ulcer and death in a population based cohort from the United Kingdom. Diabet Med. 2016;33(11):1493-1498. Skrepnek GH, Mills JL Sr, Lavery LA, Armstrong DG. Health care service and outcomes among an estimated 6.7 million ambulatory care diabetic foot cases in the US. Diabetes Care. 2017;40(7):936-942. Margolis DJ, Malay S, Hoffstad OJ,et al. Economic Burden of Diabetic Foot Ulcers and Amputations: Data Points #3. Rockville, MD: Agency for Healthcare Research and Quality. 2011. Naves CCLM. The diabetic foot: a historical overview and gaps in current treatment. Adv Wound Care (New Rochelle). 2016;5(5):191-197. Lavery LA, Davis KE, Berriman SJ, et al. WHS guidelines update: diabetic foot ulcer treatment guidelines.” Wound Repair Reg. 2016;24(1):112-126. Lipsky BA., Berendt AR, Cornia PB, et al. “2012 Infectious Diseases Society of America clinical practice guideline for the diagnosis and treatment of diabetic foot infections. Clin Infect Dis. 2012;54(12):e132-e173. Everett E, Mathioudakis N. Update on management of diabetic foot ulcers. Ann N Y Acad Sci. 2018;1411(1):153-165. McGuire JB. Pressure redistribution strategies for the diabetic or at-risk foot: part I. Adv Skin Wound Care. 2006;19(4):213-221. McGuire JB. Pressure redistribution strategies for the diabetic or at-risk foot: part II. Adv Skin Wound Care. 2006;19(5):270-277. Hanft JR, Surprenant MS. Is total contact casting the gold standard for the treatment of diabetic foot ulcerations. Abstract presented at: The American College of Foot and Ankle Surgeons Joint Annual Meeting and Scientific Seminar. 2000. Armstrong DG, McEvoy TG, Baxter G, et al. Off-loading the diabetic foot wound: a randomized clinical trial. Diabetes Care. 2001;24(6):1019-1022. Piaggesi A, Viacava P, Rizzo L, et al. Semiquantitative analysis of the histopathological features of the neuropathic foot ulcer: effects of pressure relief. Diabetes Care. 2003;26(11): 3123-3128. Yavuz M, Ersen A, Hartos J, et al. Plantar shear stress in individuals with a history of diabetic foot ulcer: an emerging predictive marker for foot ulceration. Diabetes care. 2017;40(2): e14-e15. Yavuz, M. American Society of Biomechanics Clinical Biomechanics Award 2012: Plantar shear stress distributions in diabetic patients with and without neuropathy. Clin Biomech (Bristol, Avon). 2014;29(2):223. Armstrong DG, Isaac AL, Bevilacqua NJ, Wu SC. Offloading foot wounds in people with diabetes. Wounds. 2014;26(1): 13-20. Begg L, McLaughlin P, Vicaretti M, Fletcher J, Burns J. Total contact cast wall load in patients with a plantar forefoot ulcer and diabetes .J Foot Ankle Res. 9.1 (2016): 2. Begg L, McLaughlin P, Manning L, et al. A novel approach to mapping load transfer from the plantar surface of the foot to the walls of the total contact cast: a proof of concept study. J Foot Ankle Res. 2012;5(1):32. Armstrong DG, Lavery LA, Nixon BP, Boulton AJ. It’s not what you put on, but what you take off: techniques for debriding and off-loading the diabetic foot wound. Clin infect Dis. 2004;39(Suppl 2):S92-S99. Miller J, Armstrong DG. Offloading the diabetic and ischemic foot: solutions for the vascular specialist. Semin Vasc Surg. 2014;27(1):68-74. Lavery LA, Higgins KR, La Fontaine J, et al. Randomised clinical trial to compare total contact casts, healing sandals and a shear‐reducing removable boot to heal diabetic foot ulcers. Int Wound J 2015;12(6):710-715. Greenhagen R. Complications of total contact casting. Podiatry Management. 2012;31(5):153-8. Wu SC, Armstrong DG. The role of activity, adherence, and off-loading on the healing of diabetic foot wounds. Plast Reconstr Surg. 2006;117(7S):248S-253S. Tickner A, Klinghard C, Arnold JF, Marmolego V. Total contact cast use in patients with peripheral arterial disease: a case series and systematic review. Wounds. 201830(2):49-56. Gutekunst DJ, Hastings MK, Bohnert KL, Strube MJ, Sinacore DR. Removable cast walker boots yield greater forefoot off-loading than total contact casts. Clin Biomech (Bristol, Avon). 2011;26(6):649-654. Rader AJ, Barry TP. The football: an intuitive dressing for offloading neuropathic plantar forefoot ulcerations. Int Wound J 2008;5(1):69-73. Botros, M., et al. Best practice recommendations for the prevention, diagnosis and treatment of diabetic foot ulcers: update 2010. Wound Care Canada. 2010;8(4):6-40. Snyder RJ., Lanier KK. Diabetes: offloading difficult wounds. Lower Extremity Review. Nov. 2009. lermagazine.com/article/diabetes-offloading-difficult-wounds. Hanft JR, Surprenant MS. The use of the fixed ankle walker for the treatment of plantar diabetic foot ulcerations. ACFAS Abstract presented at: Joint Annual Meeting and Scientific Seminar, American College of Foot and Ankle Surgeons. 2000. Fleischli JG, Lavery LA, Vela SA, Ashry H, Lavery DC. 1997 William J. Stickel Bronze Award. Comparison of strategies for reducing pressure at the site of neuropathic ulcers. J Amer Podiatr Med Assoc. 1997;87(10):466-472. Hartsell HD, Fellner C, Saltzman CL. Pneumatic bracing and total contact casting have equivocal effects on plantar pressure relief. Foot Ankle Int. 2001;22(6):502-506. Hissink, Rutger Jan, Hendrik Anton Manning, and Jeff G. van Baal. “The MABAL shoe, an alternative method in contact casting for the treatment of neuropathic diabetic foot ulcers. Foot Ankle Int. 2000;21(4):320-323. Hanft JR, Surprenant MS. The use of the custom-molded healing sandal for the treatment of plantar diabetic foot ulcerations. Abstract presented at: Joint Annual Meeting and Scientific Seminar, American College of Foot and Ankle Surgeons. 2000. Rheinstein J, Yanke J, Marzano R. Developing an effective prescription for a lower extremity prosthesis. Foot Ankle Clin North Am. 1999;4(1):113-138. Baumhauer JF, Wervey R, McWilliams, J, Harris GF, Shereff MJ. 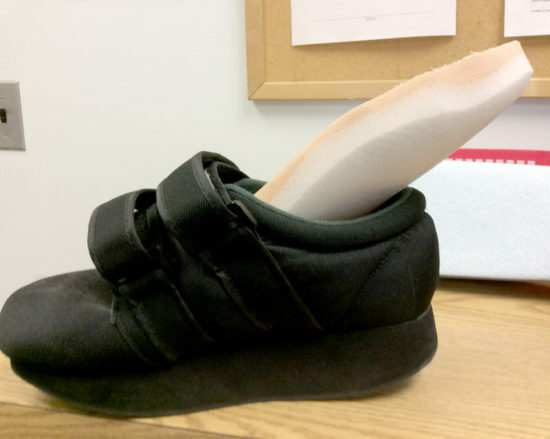 A comparison study of plantar foot pressure in a standardized shoe, total contact cast, and prefabricated pneumatic walking brace. Foot Ankle Int. 1997;18(1):26-33. Johnson DJ, Sear BJ, Shevitz AJ, et al. A total offloading foot brace for treatment of diabetic foot ulcers: results from a halted randomized controlled trial. Wounds. 2018: pii: WNDS20180418-2. [Epub ahead of print]. Guzman B, Fisher G, Palladino SJ, Stavosky JW. Pressure-removing strategies in neuropathic ulcer therapy. An alternative to total contact casting. Clin Podiatr Med Surg. 1994;11(2):339-353. 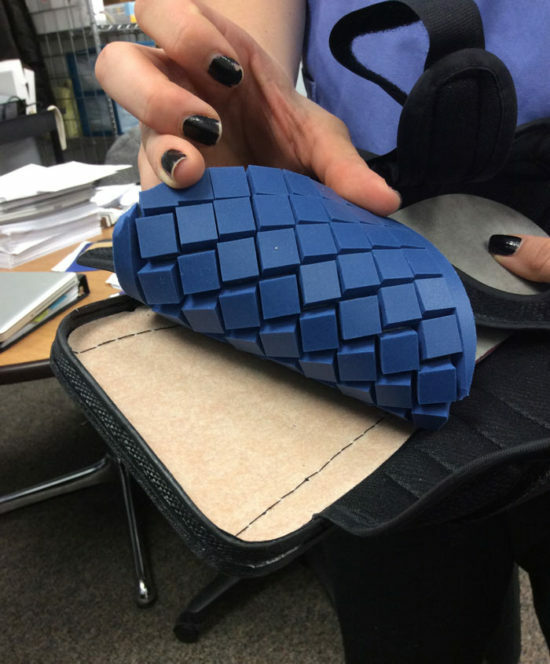 Bus S. Precision orthotics to improve the effectiveness of orthopedic assistive devices: therapeutic footwear. Abstract presented at the International Society of Prosthetics & Orthotics World Congress. 2017. Najafi B, Lee-Eng J, Bharara M, Armstrong D. Patient-centric device design of smart insoles for real-time monitoring of plantar pressures. Presented at the Seventh International Symposium on the Diabetic Foot, The Hague, the Netherlands, May 2015. Elraiyah T, Prutsky G, Domecq JP, et al. A systematic review and meta-analysis of off-loading methods for diabetic foot ulcers. J Vasc Surg. 2016;63(2):59S-68S. Wu SC, Jensen JL, Weber AK, Robinson DE, Armstrong DG. Use of pressure offloading devices in diabetic foot ulcers: do we practice what we preach? Diabetes Care. 2008;31(11):2118-2119. Raspovic A, Landorf KB. A survey of offloading practices for diabetes-related plantar neuropathic foot ulcers. J Foot Ankle Res. 2014;7(1):35. Crews RT, Shen BJ, Campbell L, et al. Role and determinants of adherence to off-loading in diabetic foot ulcer healing: a prospective investigation. Diabetes Care. 2016;39(8):1371-1377. Crews RT, Candela J. Decreasing an offloading device’s size and offsetting its imposed limb length discrepancy lead to improved comfort and gait. Diabetes care. 2018;41(7):1400-1405. Macfarlane DJ, Jensen JL. Factors in diabetic footwear compliance. J Amer Podiatr Med Assoc. 2003;93(6):485-491. Arts ML, de Haart M, Bus SA, Bakker JP, Hacking HG, Nollet F. Perceived usability and use of custom-made footwear in diabetic patients at high risk for foot ulceration. J Rehabil Med. 2014;46(4):357-362. Pal S. Improving compliance with diabetic footwear. Lower Extremity Review. July 2015. lermagazine.com/special-section/diabetic-foot-care/improving-compliance-with-diabetic-footwear. Crews RT, Bowling FL, Boulton AJM. “Controversies in off-loading: should big brother be watching? Curr Diab Rep. 2009;9(6):417. Pollo FE, et al. Plantar pressures in total contact casting verses a diabetic walking boot. Abstract presented at Orthopedic Research Society Annual Meeting. 2001. McGuire J. Transitional off-loading: an evidence-based approach to pressure redistribution in the diabetic foot. Adv Skin Wound Care. 2010;23(4):175-188. McGuire J. Diabetes: options for offloading. Lower Extremity Review. July 2009. lermagazine.com/article/diabetes-options-for-offloading. Boulton AJ. The diabetic foot. Med Clin North Am. 1988;72(6):1513-1530. Brown D, Wertsch JJ, Harris GF, Klein J, Janisse D. Effect of rocker soles on plantar pressures. Arch Phys Med Rehabil. 2004;85(1):81-86. June 5, 2018 Does athletes’ divided attention affect mechanics associated with ACL injury?